Reading Junior Scholastic Online... Speech to Text Tip! Wednesday - WARM UP: Students analyzed the map to the right and used it as a "metaphor" for government. Questions to consider: 1) What are the themes of these maps? 2) What are similarities and differences between the states? 3) How does this relate to government? 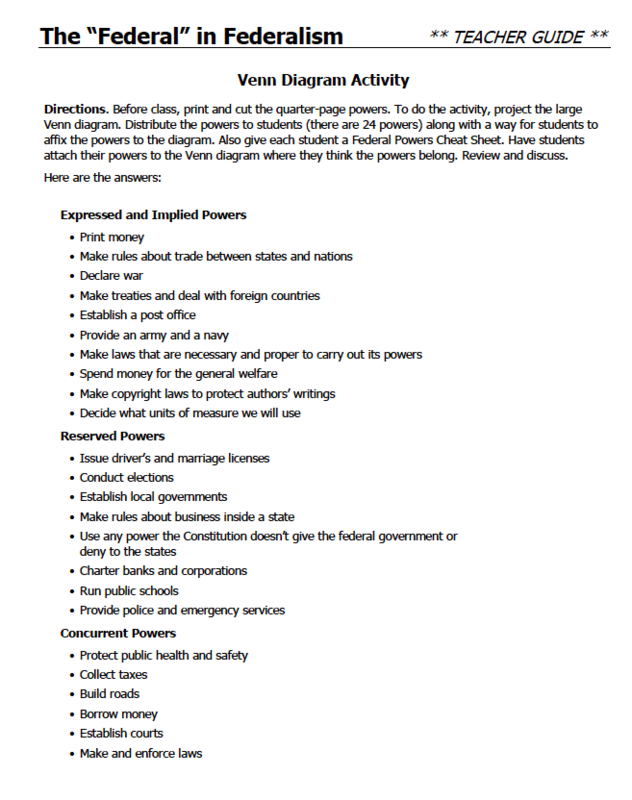 Then students completed the first page of their study guide relating to federalism (and page 3 at the top, the 7 key ideas of the Constitution described in the preamble). Attached is a study guide answer key. HW: Review the study guide for 20 - 30 minutes. HELP WITH VOCABULARY - THIS INCLUDES PICTURES! 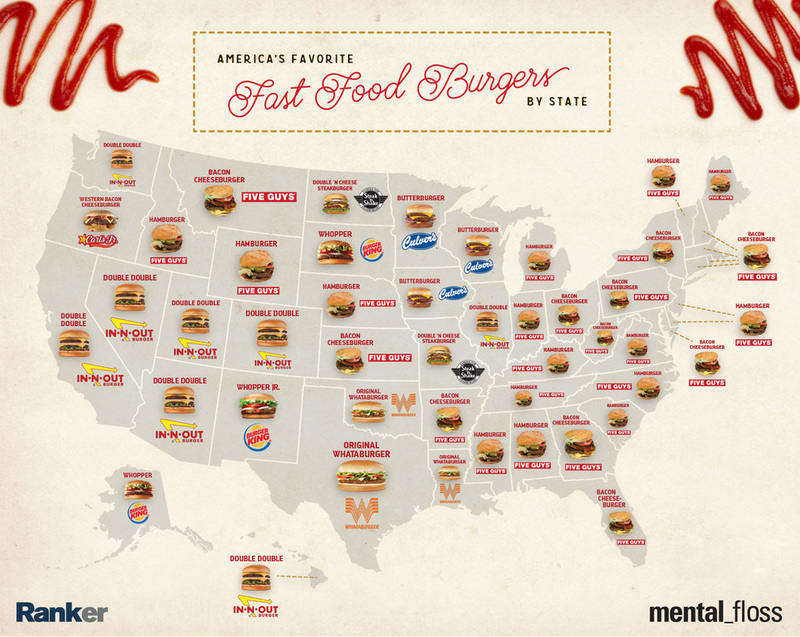 The map below was a metaphor for federalism... how? Want to see what Washington DC looks like?? Check out the video below!!! You don't need to know this process this year... but in high school you will :) Enjoy challenging yourself! Monday 1/11 - WARM UP - Students pretended that we just defeated aliens and were making a list of ten rights or protections that we wanted to be in our new society. This activity (page 2) is attached in this lesson plan. Then Mrs. Hancock read students the historical summary (page 3). Students who were done with their "Anatomy of the Constitution" notes and worksheets from Friday moved onto matching the protections in the warm up to the actual Bill of Rights. Some amendments match to more than one "protection" while some match to none. Read carefully and make those connections. The answer key is in the lesson plan! Tuesday 1/12 - WARM UP - Students listened to the "More Perfect Union" flocabulary song. They filled in the blanks - here is that worksheet. Here is the answer key. Then students analyzed actual scenarios and identified which amendment applied to it. After they checked their answers they had to create three of their own scenarios. CHALLENGE HW: Watch part of President Obama's Final State of the Union address which is included below. Also here is the entire speech published on the White House website. Wednesday 1/13 - WARM UP - Students listened to the "Bill of Rights" flocabulary song. They filled in the blanks - here is that worksheet. Here is the Bill of Rights answer key. Then students completed "non examples" where peoples rights were being infringed on, and students had to identify which ammendment or right was being violated. HW: Should the U.S. have tougher gun-control laws? **Must be completed to participate in Friday's classwork - we will check it, but you KEEP it and bring to class Friday! Friday 1/15 - SOCRATIC SEMINAR!! Bring your article and any other statistics that relate to the 2nd amendment. Thursday 1/7 - WARM UP: On a sticky note students answered the question, "Why is government necessary?" The point of this activity was for students to start thinking about the larger issues surrounding government as we continue with our study of the Constitution. Then in class students read the "Preamble" and annotated it. Next students annotated their notes on the articles of the Constitution. Finally, students began worksheet activities A - F. The entire lesson is attached. Answer keys are at the end of the PDF if you need to check your work. ​Friday 1/8 - WARM UP: Students watched the Schoolhouse Rock video about the "Preamble". Using the video and their notes about the Preamble students wrote down two vocabulary words that were important or new to them. Students then completed their worksheets A - F and check their work. The game was saved for Monday (next class). The lesson is attached again here. Need help with the interview or family tree? Here is the handout with interview questions that students were given back in November. Here is the StoryCorps packet with more handouts to help. You can also go to the ﻿StoryCorps website﻿ for more help. Finally, attached is the packet students received before Winter Break with a handout they can take their interview notes on as well as directions for the StoryCorps app. Thursday - WARM UP: Students analyzed this political cartoon. 1) Write down what you see. 2) Write down the message. 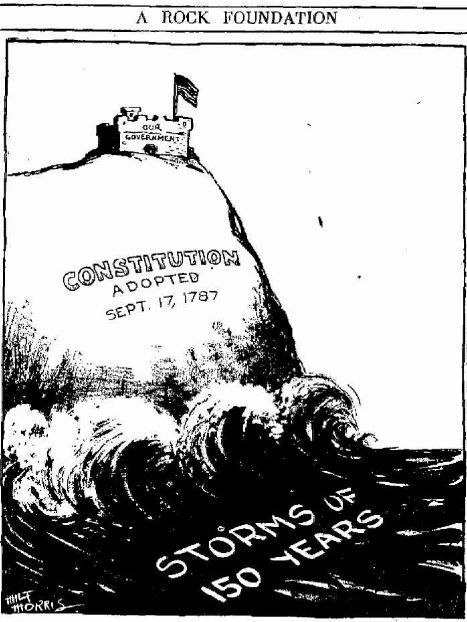 Then we began the Constitutional Convention. Then students completed Sections 10 - 12 of their notes and discussed why they would sign or not sign the Constitution. 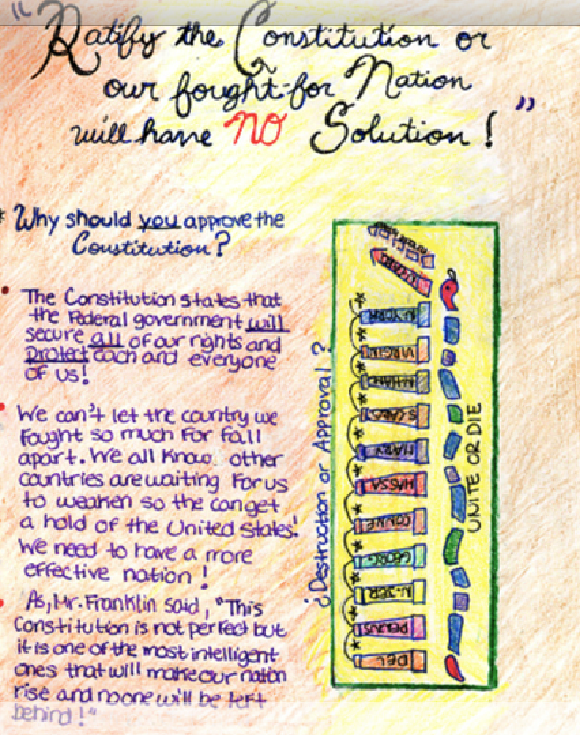 Finally students created posters supporting the ratification of the Constitution or rejecting it. Attached is an example. WANT TO LEARN MORE ABOUT THE DELEGATES AT THE CONSTITUTIONAL CONVENTION? CHECK OUT THIS WEBSITE! FRIDAY - WARM UP: Students logged onto their email and reviewed vocabulary on Quizlet for five minutes - https://quizlet.com/Hailey_Hancock2/folders/constitution. On their Friday "Warm Up box" they wrote down in their if they had any questions or vocabulary concerns. They turned in their Warm Up then began working in stations to review the Articles of Confederation and the Constitutional Convention. Students FIRST need to complete their processing activity then they can review in the stations. There are 4 stations: 1) A reading challenge review game using the SmartBoard and students notes 2) The Articles of Confederation review and matching game 3) Constitutional Convention crossword & study guide 4) The John Green Video and then map practice ... TEST NEXT WEDNESDAY! Use this map to analyze population patterns around 1790. How do you think population influenced the writers of the Constitution? Tuesday - WARM UP: Students watched this video about StoryCorps and the "Great Thanksgiving Listen". Write down the main idea and whether or not you completed the interview and if you have any question. The rest of class students worked on their Trimester 1 reflection. Students are completing this activity to recognize where they have grown academically and behaviorally. Attached is the reflection worksheet we used. Wednesday - WARM UP: Students wrote down two things they know about the Constitution and two things they want to know. During class students used their reflections from Tuesday to then fill out a google form that they sent to Mrs. H. The google form is in your email. Once students submitted their Google Form they completed their Constitution pre-test on Socrative. Here is a copy of it. Finally students worked on the map under "Geography Challenge" in their notebook for this unit. Directions are on the back of the map. Thursday - WARM UP: Students skimmed pages 32-33 in their atlas and then they answer the question in part A. They also had to list the states that had the highest percentage of slaves in the 1790's using the map with part G. In class students reviewed the map and questions under the Geography Challenge. Use the maps to the left to help. Here is the answer key. Then students completed a preview activity involving music selection, completed notes connecting the activity to history, and read section 1 of the textbook chapter on the Constitution. Friday - WARM UP: Review pages 34 - 35 in the atlas. 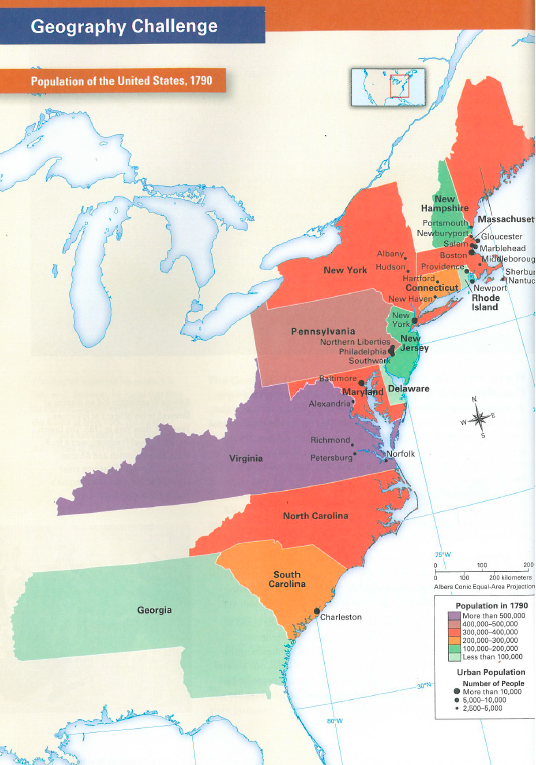 1)What % of Americans lived east of the Appalachian mountains in 1790? 2) How does population density change between 1790 - 1820? In class students completed sections 2 - 4 of their notebook and began the Constitutional Convention simulation. Here is the entire interactive notebook, and all of the role cards so students can learn more about the other historical characters involved. 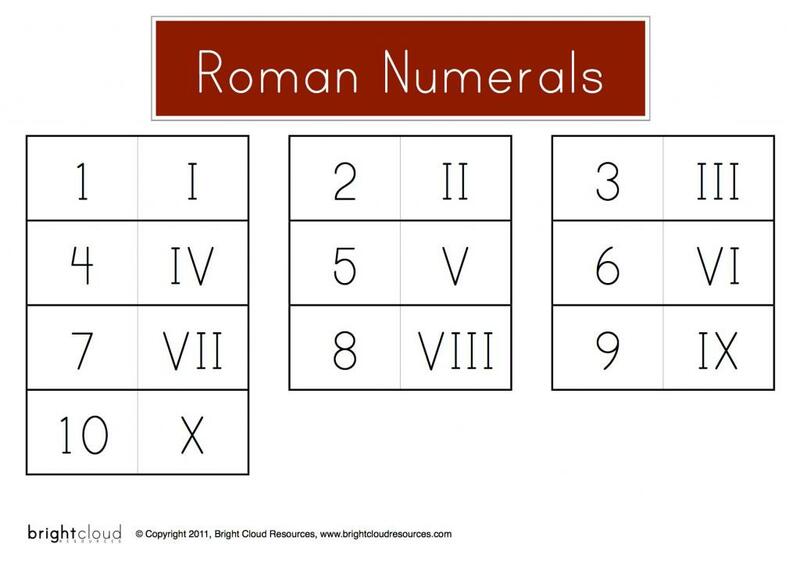 Here is the answer key for all the guided notes. ATTACHED IS THE READING FOR THE CONSTITUTION NOTES. To the left is a sample of a family tree. The first box is you! From there you can fill in information relating to your parents and grandparents. If you want to add "other branches" you may :) More information coming soon! Here is the handout about the HW that students were given.